For an on-premises Confluence, when you choose to index document permissions associated with Confluence items, the Coveo connector needs a security provider. When document permissions are indexed, in Coveo search results, a user searching for Confluence content only sees the content to which he has access in Confluence. 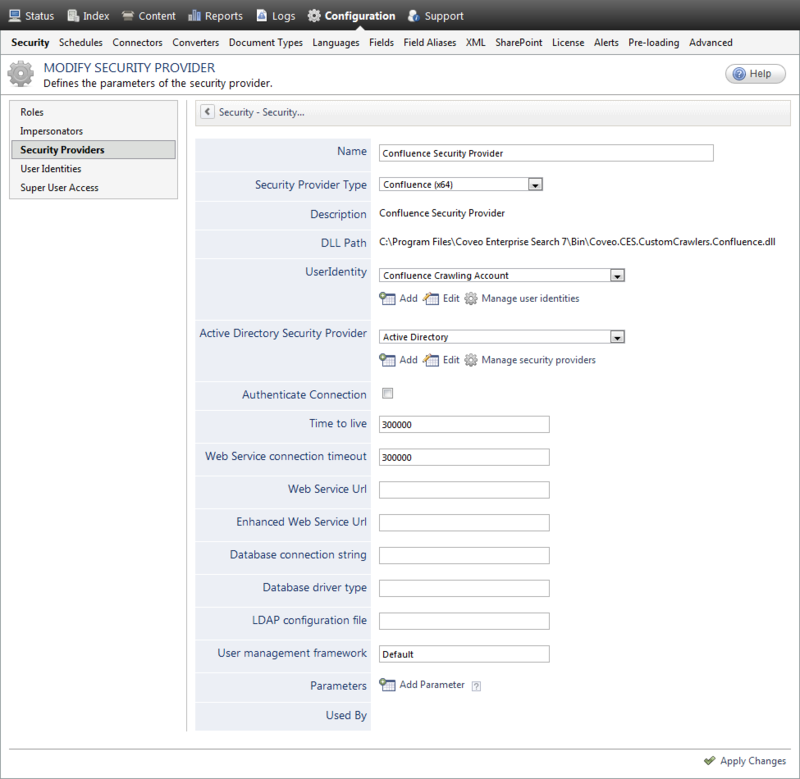 Select the Confluence user identity that you created previously (see Adding a User Identity). Select Active Directory or a custom Active Directory security provider that you created for a specific domain to allow this Confluence security provider to map Confluence permissions to AD users (see Configuring an Active Directory Security Provider). CES 7.0.7183+ (November 2014) You can select an email security provider to allow this Confluence security provider to map Confluence permissions to emails. This is useful when your users are authenticated in the search interface with the same email address specified for their Confluence user, thus allowing them to also see secured documents to which they have read permissions (see Configuring an Email Security Provider) . Note: Connecting to an email security provider requires the plugin version 1.0.1+ (see Installing the Coveo Plugin for Atlassian Confluence). Select this check box when you selected your Confluence user identity in User Identity to use it to authenticate the connection when connecting to the Confluence web services. The check box is cleared by default. A valid database connection string to allow the connector to retrieve the security information from the Confluence database. Driver type to use to connect to the Confluence database. Possible values are: SqlClient, OleDb, or Odbc. For LDAP integrations only,	path of the Confluence LDAP configuration file (atlassian-user.xml) from which the connector automatically extracts the LDAP connection settings. Note: When your Confluence server has an LDAP integration, the Confluence connector must also connect to the LDAP servers to extract the information of the LDAP members and to retrieve the members of LDAP groups (see the Atlassian document Connecting to an LDAP Directory). Default	Confluence user management framework to use (see the Atlassian document Understanding User Management in Confluence). Possible values are: Default, AtlassianUser, or OSUser. This parameter is optional. Number of milliseconds before refreshing the cache of members. The default value is 300000 ms (5 minutes). Maximum number of milliseconds a Web service call should wait. The default value is 300000 ms (5 minutes). Leave this option cleared as it does not apply to this type of security provider. Configure and index a Confluence source (see Configuring and Indexing an Atlassian Confluence Source With the Legacy Connector).